The best book so far and the perfect ending of the Starbound trilogy! I LOVED this book! All of the pieces fit together perfectly and there was a great balance between new elements specific to this book and old elements continued throughout the series. Seeing all of the characters run into each other and realizing how interconnected all of their stories are was fascinating and gave me exactly the fangirl feels I wanted from the conclusion of this trilogy. As with the two previous books, I loved the characters first and foremost. I fell in love with Sofia first, mainly because we had met her in the second book, so I already appreciated her character. I loved her character’s complexity; she was so much more than a con artist or a flirt. She hated herself for the very things that were keeping her alive. She was amazing at surviving, but she was also consumed by a need for vengeance. I wanted to give her a hug and a high five all at once. Gideon was also a complicated character. I loved the warring parts of his character: hacker in the shadows and frustrated boy who wants to go out and change things himself. His relationship with the online community and his perspective on the events of the previous books added interesting layers to the story. I can’t say that I fell for Gideon as hard as I fell for Tarver or Flynn, but I always liked reading his chapters, and I enjoyed his voice. Gideon and Sofia’s relationship was the most complicated of the trilogy’s. They end up working together mostly by accident, both of them keeping their cards close to their vests. From the first pages, I loved their dynamic and their conversations with each other. However, their obsessions with secrecy kept each other apart, even as they started falling for each other. It was frustrating that neither of them would open up and explain their real motivations to the other, but—unlike with most miscommunication-based romances—I actually understood and appreciated their reasons for keeping quiet. Even once their romance bubbled to the surface, their secrets still got in the way. I loved them as a couple, but even I had my doubts that a relationship between them would work. I can’t thank Kaufman and Spooner enough for building barriers between Sofia and Gideon that even the reader couldn’t completely knock down. 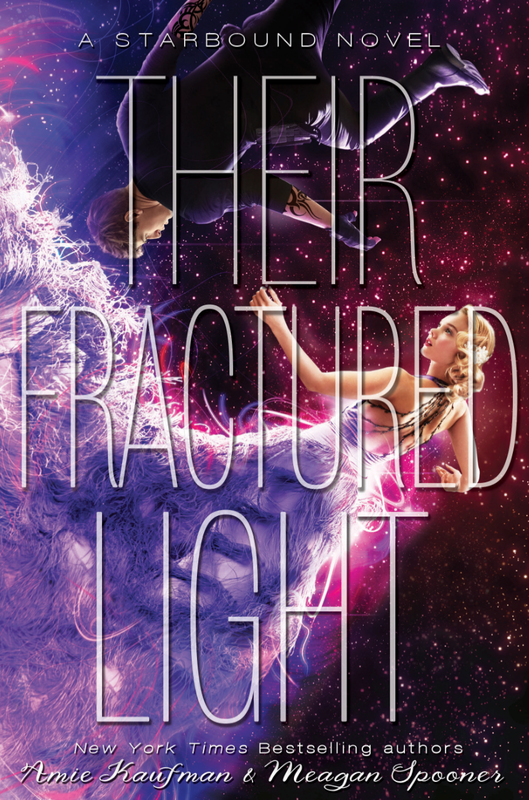 Their Fractured Light is more than a romance though. The whisper plot that connected book one and book two is still prevalent, guiding the series to its climax. The mystery surrounding LaRoux Industries and the whispers continued to grow and evolve, changing as each character added new pieces to the puzzle. As with the rest of the series, the plot was addictive; I had to keep reading to see where the story would end up. I don’t want to spoil anything, but the way that everything fit together was immensely satisfying and a great ending for the story. Possibly the best part of this book was realizing how interconnected the three stories in this trilogy actually are. Lilac, Tarver, Flynn, and Lee all come back (to lots and lots of fangirl squeals from me). Each character had a connection to another, and most of them weren’t positive. Watching all of the characters sort out their preconceptions and conflicting loyalties was fascinating and frustrating, because I wanted them to hurry up and be the big happy family I knew that they could be. There were a few shocking reveals as to how the characters’ lives fit together, which I liked, even if I saw one of them coming. Overall, the conclusion of the Starbound trilogy did not disappoint. If you’ve been on the fence about finishing the series, you definitely should! The characters are alive and the plot is gripping in a way that I’ve rarely seen. I’m honestly crushed that the series is over—I read it so quickly that I feel like I need more time with all of the characters.